Our group has come up with an innovative idea to make sure The Bridge Street District thrives. We propose the 3.75 acre lot located in the middle of the district be turned into a light rail station. The rail line would link Dublin to other parts of Franklin County, including OSU and downtown Columbus. This would lead to growth and tourism in the city of Dublin as well as a modern connection between the large, influential suburb and the major job and tourism areas of Ohio State and downtown. On top of the benefits to the economy, residents that live in The Bridge Street District, and all of Dublin, will have an easy way to commute to their jobs. This would be revolutionary for the city of Dublin, and all of Central Ohio. 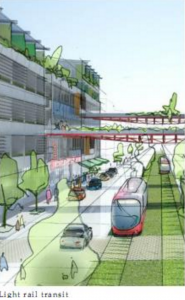 We understand that a light rail line won’t happen overnight, so this would be built as a flexible space in order to make economic sense until the line comes. The rail station would have space for several local shops and restaurants that people could easily walk to and enjoy. Also, because this lot is relatively large, space could be set aside for a park, adding to the community feel and allowing for space to gather. When the time does come to make this a light rail station, some adjustments on the interior can make way for the trains and track can be laid. We see this as an opportunity for the city of Dublin to work with the city of Columbus and COTA to bring an innovative and necessary alternative to cars to the Columbus area. This busy and crowded area of the city, including the Sawmill Road corridor, can become the leading example in Ohio of smart and innovative urban planning. 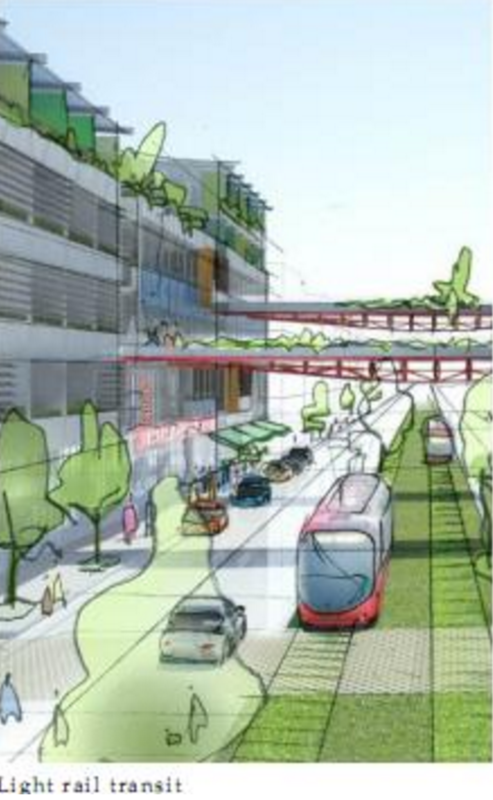 Adding light rail would be a catalyst for more development, higher densities, and other rail lines, as well. This is Dublin’s signature project; the city should make it loud and clear that they are on a path to a better future. This would be that statement to Columbus and the rest of the state that they are on the forefront of building a better tomorrow.